IHS iSuppli analyst Rhoda Alexander didn't disclose detailed return rate estimates during her chat with CNET, though she did say, "It seems to be linked in a lot of cases to a steep learning curve of the [Windows 8] OS—which is not necessarily intuitive." In other words, the presumed cause for the high level of returns isn't a problem with the Surface RT tablet, which is a beautifully designed piece of hardware. It's an underlying problem with Windows RT itself—and it isn't the only one. Before we dive into this too deeply, it's worth noting that many of the Surface RT tablets sold thus far probably sold via Microsoft's website and stores, as Staples and Best Buy—the only other retailers selling the slate—didn't begin offering it until mid-December. Microsoft doesn't share retail sales information with analysts, so iSuppli's estimates are far from official and likely gleaned from a mixture of third-party retailers and component channel sources. Interface concerns, if truly a root cause, could lead to higher return rates on other Windows RT tablets such as the Asus VivoTab RT. "The system is rife with powerful touch gestures, but none of them are immediately obvious if you pick up the tablet without any training," PCWorld editor Jon Phillips wrote. "…What about the gesture that brings up the snap screen for side-by-side multitasking? Or the gesture that lets you cycle through open apps with a finger swipe? Or the gesture that produces all your Favorites in Internet Explorer? These and other touch controls aren't self-evident." 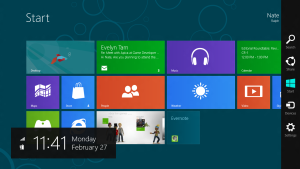 Is the new-look Windows UI too radical for users? Mix a confusing interface with a neutered operating system, add a dash of ignorance about that operating system's inherent limitations, and you've got a recipe for high returns. Worse, all of those flaws are inherent to every Windows RT tablet—not just the Surface. The impending February 9 launch of Microsoft's Surface Pro tablet—which sports an Intel Core i5 processor and the full-fledged version of Windows 8—could shine more light on whether it's the modern UI interface or Windows RT's inherent limitations that are driving the alleged run up of Surface RT returns. Regardless of the reason, and regardless of even whether or not IHS iSuppli's return rate estimate is exaggerated, one thing is already clear: Windows RT is teetering on the brink of disaster.